Hi, I’d like to introduce myself. 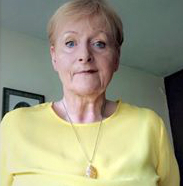 My name is Denise Mahon, I live in Athboy, Co. Meath I have two daughters. I was widowed in 2016 May 25th. I had a childcare business that I ran from home. I ceased trading at the end of February 2016 to be my husband’s primary carer while he awaited a lung transplant; unfortunately he never achieved his goal, twelve weeks later to the day he passed away. I am not sharing this with you all so you will feel sorry for me; I am doing this so you can see that there is always hope and strength within all of us. It has taken me this time to start looking forward so I am starting a new business. A business in which I feel so much passion for. In fact I have named the business “Butterfly Harmonies”. As it holds a real meaning for me. Butterfly meaning new beginnings and Harmonies meaning balance. My plan is to move forward with a positive outlook and mindset. I am so grateful to have a second chance, to once again do something I really enjoy and feel fulfilled with. I am a Feng Shui practioner. And mainly to help release the energy in our homes to support us in all aspects of our daily living.